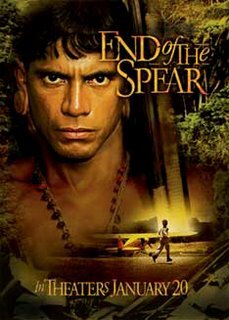 Is anyone else as disappointed as I was to hear that the producers of the movie End of the Spear cast Chad Allen as the part of both Nate and Steve Saint? I'm not a big movie watcher but we were looking forward to seeing this movie. We have read so many books about them. Then I read this post over at Tim Challies and this one by Jason Janz and I had to take a step back and think a little more about it. Good actors draw you into the story and make you believe that they are the person they are playing. You forget they are actors and are drawn into the drama. He is using his role in the movie as a platform for his lifestyle. That's what makes that difficult for me. Now if and when I go see the movie I will be also thinking about Chad Alan and not just the what happened to these men and the work that God did in the Auca Indians; thus my disappointment. This is a controversy that didn't need to happen and is casting a cloud over an otherwise excellent story. My friend who has written a children's book on Nate Saint is seeing the movie right now. When I told her about this, she was as disappointed as I was. I will be interested in hearing her opinion. Al Mohler shares his thoughts here. Update: My friend just returned and she thought it was not a problem. She was drawn in to the story and not distracted at all. Chad Alan's part was minimal and 95% of the movie focused on the Aucas and Steve Saint as a little boy. The story is compelling and she definitely would encourage others to go see it.